The largest population of Belugas in the world is at Churchill, on Hudson's Bay, in northern Canada, with thousands of Belugas. The government wants your comments, to have the best boating rules and the best plan to protect these Belugas. 1. Require cages around propellers, to protect Belugas from cuts. Some boats already use them (p.11), but the draft has no rules. 2. Enforce a speed limit when Belugas are within 400 meters. The draft has no speed limit. Speed limits have saved lives of right whales. 3. Provide a seasonal floating pier where people can see Belugas, without any noise or disturbance from boats. The map on page 16 shows many Belugas swim close to shore, where a pier can be. (C) areas where boats may go but need to avoid Belugas. . . Belugas will associate different buoys with different activities by boats. Time will tell how many Belugas choose each area. The draft asks boats always to stay more than 100 meters away from Belugas. If Manitoba keeps Belugas that far away, so people can barely see them, the Belugas will lose interactions which interest them, and people will visit Churchill less and visit captive Belugas more, which is not as enriching. Click here to email these comments by Monday March 7, 2016 (or short version if this works better in your email program, or cut and paste the lines above). You can also sign the petitions on Change.org and ThePetitionSite (Care2). Hundreds of people around the world are signing these petitions. Many of them, and their friends, are potential tourists to Churchill if the Belugas are treated well. So far, 26% of signatures are from the USA, Germany 14%, UK 9%, Netherlands 5%, Italy 4%, Canada 4%, France 4%, Belgium 4%, Australia 3%, Austria 2%, Brazil 2%, Spain 2%, and other countries 20%. Cello youtu.be/iL6jcT7jAcI This shows a cage around the propeller, like our Comment 1 above. Having the cage continue behind the propeller would help too. Flute on Chinese TV youtu.be/884V4o21nu0 At 11:49 this Chinese TV broadcast shows Churchill Belugas listening to flute. In all these examples Belugas came to the boat and stayed with it, by their own choice. These are intelligent, curious creatures. They have shown they like to approach people in boats. They deserve to have their choices honored, safely. If Manitoba keeps Belugas away from people, the Belugas will lose interactions which interest them, and people's only alternative will be to watch captive Belugas, which is not as enriching. Belugas deserve a choice of areas where Belugas can approach boats (A), or be completely separate from boats (B). In the approachable (A) areas, boats would be required to have propeller cages, go slowly, and maybe to have silent electric engines, so arrivals and departures would be quiet. Time will tell how many Belugas choose each area. Any areas where humans need boating access, would be defined as (C), where boats do avoid Belugas where possible, and have speed limits. The areas need distinct buoys, not just lines on charts, so Belugas can see the buoys and associate the different buoys with the different activities of the boats. Rules on boating would be set by the Canadian federal government, not by Manitoba, but Manitoba can speak up for the rules it wants. The draft plan approvingly cites federal guidelines in Quebec which keep boats 100 meters away from whales everywhere, and have no quiet spots where Belugas can avoid boats completely. Those guidelines in Quebec do not protect whales, since they do not require propeller guards or enforceable speed limits, and do not have any areas where whales can avoid boats. In fact Quebec whale-watching boats and researchers pursue some whales wherever they are, and come right up to the 100-meter limit. Speed limits protect whales in parts of Alaska, Florida and Georgia. In Florida and Georgia speed limits eliminated deaths from ship strikes. Fines, and letters which compared compliant and non-compliant ships, were the most effective enforcement. Voluntary limits have reduced speeds in Quebec, but they reduce deaths from ship strikes by only 36-39%. Canada has exclusion zones to protect fish in the Atlantic, Newfoundland and Labrador. Belugas move in and out of estuaries daily, so a small exclusion zone might not serve their needs. The Nelson estuary has more Belugas than Churchill or Seal River, and is undeveloped, so it might offer a place where Belugas are undisturbed. Or any estuary can be divided down the middle, with half undisturbed. Manitoba understands that boats and propellers can hurt Belugas. Their only solution is to endorse federal guidelines which would keep boats so far away that Belugas and people can barely see each other, but not far enough to let Belugas ignore the boats. It is better to have propeller guards, buoys and speed limits to protect Belugas, while allowing the interactions that Churchill is famous for, when Belugas choose interaction. Old: "The Department of Fisheries and Oceans’ whale-watching guidelines applied in other regions suggest that boaters use a slow speed if within 400 m of whales and idle when they come within 100 m of them (http://www.qc.dfo-mpo.gc.ca/mammiferes-mammals/bonnespratiquesbestpractices-eng.html)." Better: "A seasonal pier would increase Beluga tourism at minimal impact. For boats, the Department of Fisheries and Oceans should consider requiring propeller guards and speed limits, and distinguishing areas where boats may quietly stay with Belugas, from areas (perhaps the Nelson estuary) where boats must stay away." The current federal guidelines in Quebec include among other comments, "Avoid approaching any whale closer than 100 m or getting in its path. If your boat accidentally comes closer than 100 m to a whale, stop or keep the boat stationary and let the animal pass." The current federal regulations say, quite vaguely, "7. No person shall disturb a marine mammal except when fishing for marine mammals under the authority of these Regulations." An amendment to the federal regulations, proposed in 2012, and not yet adopted, would define "disturb a marine mammal" to include "7. (2)(b) swim with it or otherwise interact with it" or 7. (3) "approaching" it with a vessel closer than 50 meters in the Churchill estuary and Seal River. The tour companies point out they break that distance standard as soon as they pull away from the dock. The "no interaction" standard would prohibit playing music for Belugas in Churchill, even when they like it. The proposal supports its prohibition by saying, "interaction with humans may interrupt or prevent marine mammals from completing normal life processes (e.g. mating, calving and nursing) and threaten the survival of individual animals." The proposed amendment recognizes that some interactions are a problem, not all, and it could be more sensitive in distinguishing harmful from enriching interactions. A full prohibition denies marine mammals' normal life processes of curiosity and exploration of the modern world. Better protection of marine mammals would be created by propeller cages, speed limits (especially for large ships which they propose to exempt), forbidding physical contact, and zoning areas with and without boating access. Letting mammals choose interaction with responsible boats or with people on a pier lets marine mammals pursue what interests them and preserves wild tourism as a better alternative than aquariums. The amendment already exempts 7. (4)(a) commercial vessels in transit and 7. (4)(b) licensed seal observers. Language can be added to exempt "7. (4)(c) commercial tour boats and web-broadcasting boats in the Churchill estuary and Seal River, using propeller cages and not exceeding 6 knots, which would also be allowed to play music no louder than Beluga calls." Beluga calls are about 100 dB, using the underwater decibel scale, which is different from the scale in air. Federal rules are not officially open for comment, but you can write to elected officials or Fisheries and Oceans, fax 1-613-954-1407. Most Beluga tourism is based in Churchill. 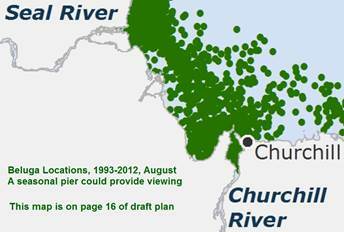 The report also applies to Seal River, 45 kilometers north, and Port Nelson, 200 kilometers south. For more information on the Manitoba Belugas, click dfo-mpo.gc.ca/species-especes/species-especes/beluga-west-beluga-ouest-p-eng.htm.